As we produce research publications associated with our project, we will share summaries here. This is the first of several upcoming research summaries in which we’ll share our findings and what they mean for stakeholders and scientists. Our first post is authored by Danielle Kirkpatrick, a recent PhD graduate from Michigan State University. Spotted wing drosophila (SWD) rapidly spread to nearly every continent and can now be found across a diverse range of climatic conditions. In order to survive in environments ranging from very cold to very hot, SWD appears to respond to seasonal changes by producing separate morphs (flies that appear externally different) that can survive in a range of temperatures and environmental conditions. To survive low or freezing temperatures like those found in the northern regions of the United States during late fall and winter months, .SWD has what is referred to as a winter morph. Winter morphs have darker pigmented bodies and longer wings than summer morphs. Within winter morphs, flies appear to have longer wings and darker bodies as temperatures decrease. In cooler states such as Michigan, captures in monitoring traps baited with attractants that production odors related to fermentation include a mixture of summer and winter morphs during late summer and the beginning of fall. As temperatures decrease into late fall and winter months, captures of summer morphs cease, and only winter morphs are captured. Winter captures of SWD in traps are extremely low or zero. After January, no winter morphs are captured in traps, and the first summer morphs are not captured in traps in northern regions until late May or June. Understanding differences in response to cues between the two morphs could potentially lead to optimized traps that are morph-dependent and improved monitoring during the winter and early spring periods. Winter morphs are uncommon in southern states where adult flies can be captured all winter long. While many different types of traps and attractants are used for capturing SWD, and attractive volatiles for summer morphs for use in trapping have been identified, there is a lack of information regarding volatiles that might be important for overwintering behavior. 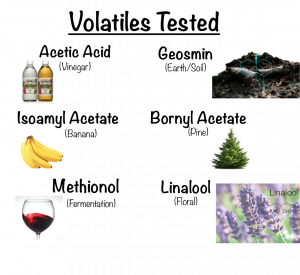 To better understand what odors are attractive to these two morphs and thus at different times of the year, laboratory reared SWD were used to evaluate antennal responses to six odorants (isoamyl acetate, geosmin, methionol, linalool, bornyl acetate, and acetic acid) using electroantennogram (EAG). We also conducted scanning electron microscope (SEM) photographs to assess antennal morphology, and no-choice test assays in small glass arenas and small T-maze assays to evaluate behavioral responses to the volatiles. Three volatiles, isoamyl acetate, methionol, and acetic acid had been previously tested with summer morphs and elicited a positive response, and were used as a positive control. Three additional volatiles, geosmin, bornyl acetate, and linalool, were evaluated as potential volatiles important for driving overwintering behavior in winter morphs. In EAG studies, we found that winter morphs had a reduced response to all the volatiles tested when compared with summer morphs. There was a significant difference in response between the two morphs to the volatiles geosmin, acetic acid, and isoamyl acetate. When comparing antennal morphology using SEM photographs, we found that the total antennal area was not different between the two morphs, but that summer morphs had numerically more small basiconic sensilla, which are the sensilla responsible for detection of the volatile geosmin. In no-choice assays in glass arenas, winter morphs were more attracted to geosmin and bornyl acetate compared with the summer morphs. T-maze assays tested avoidance or attraction to geosmin, and we found that summer morphs exhibited a negative response to geosmin and winter morphs showed a positive response. When the response index was compared to zero (no response), summer morphs showed significant avoidance to geosmin and the winter morphs response was not significantly different from zero. These results of these assays suggest that both winter and summer morphs have the same type of receptors present for detecting volatiles in the environment. However, the winter morphs consistently had a reduced response to the volatiles when compared with summer morphs, providing insights into behavioral strategies used between the two morphs for locating resources and successfully surviving cold winter months in northern regions. Winter morphs are thought to be quiescent (essentially hibernating) during the winter, and a reduction in the capacity to respond to environmental stimuli and cold winter stress would likely increase survival. The volatile geosmin is a known repellent for some species of Drosophila; it is typically a warning sign for the presence of toxic compounds for insects and negatively effects behavior. However, winter morphs were not repelled by geosmin, suggesting that their behavior could be adapted to give them an advantage for successful overwintering by potentially using geosmin as an indication of suitable overwintering sites. There are important management implications for increased knowledge on the winter morphs and their behavioral responses. We expect that surviving populations of winter morphs are quite low given low spring adult captures; this provides a unique opportunity to exploit their winter resources and further reduce the surviving population by targeting winter morphs after the population bottleneck. Additional studies could further elucidate preference for specific resource signals between morphs. Further defining the overwintering requirements for this pest will allow us to better understand their seasonal biologg and make appropriate management decisions. Read the whole study here: Kirkpatrick, D. M., H. L. Leach, P. Xu, K. Dong, R. Isaacs, and L. J. Gut. (2018). 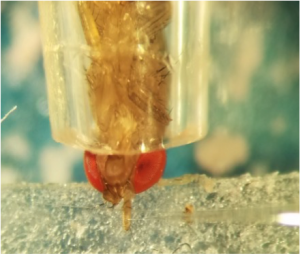 Comparative Antennal and Behavioral Responses of Summer and Winter Morph Drosophila suzukii (Diptera: Drosophilidae) to Ecologically Relevant Volatiles. Environmental Entomology. doi.org/10.1093/ee/nvy046.